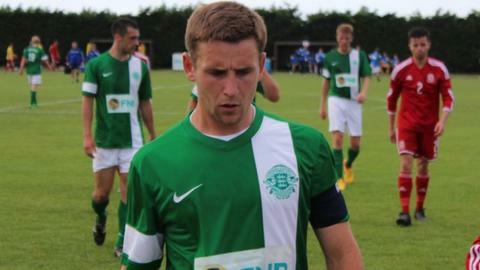 Guernsey FC captain Sam Cochrane says he is unhappy with how his side played in their 3-2 loss at Sittingbourne. The Green Lions led 2-0 after 35 minutes through goals from Marc McGrath and Dominic Heaume, but Sittingbourne pulled one back before half-time before scoring twice after the break. The loss means Guernsey have not won any of their last six games. "I'm not happy at all, we've thrown that away completely," Cochrane told BBC Radio Guernsey. "We were in a controlling position at half-time and I can't put a finger on what it is. It's incredibly difficult and it's frustrating, but this is football." The loss left Guernsey 18th in the Isthmian League Division One South, having not registered a win since their second game of the season. "All we can do is roll our sleeves up and go again and forget it and move on," added Cochrane. "This is part and parcel of what happens. You go through times that are difficult and you go through times when you have momentum and winning games. "You've got to deal with it and you've got to be mentally strong and we've got to deal with this one, move on, fight, and address the situation."